Drizzle. Grey. Those two words sum up the weather this weekend. So we were very happy to be invited to a brunch at our eldest daughter and son-in-law's home on Sunday after early church. Seven of us (including the Little Miss and her parents) gathered together in person and our youngest daughter and her husband joined us from Rome via Skype for a few fun moments. 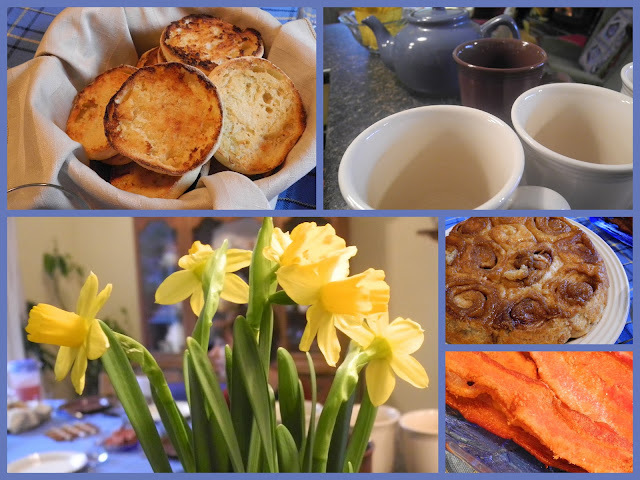 Yellow daffodils shone brightly as we munched on huevos rancheros, bacon, English muffins, cinnamon buns and berry smoothies. It was the perfect way to spend a drizzly February afternoon. I hope your weekend was equally fine. Joining with Mary of the Little Red House for Mosaic Monday. Oh Yum, I want to come to your house for breakfast! Very tasty mosaic! This is a very appetizing post, Lorrie! It's nice that you were able to share brunch with your family. Those bright yellow daffodils are just the perfect touch of spring!! and your menu sounds and looks yummy!! It does sound like the perfect afternoon! The food looks delicious! Sounds like a lovely visit and brunch with your family. I wish you a Happy week ahead. What a lovely SUnday you've had! Breakfast look delicious and the daff's are so pretty. Looks like a terrific brunch - how nice for you to share with family on a gray day. Thanks for visiting my little blog project! What a lovely morning with family! My mouth is watering! Brunch at your daughter's house. What a beautiful and delicious setting...I love the daffodils! That mosaic features everything so nicely that I am beginning to feel hungry. Just lovely colors and the daffodils do add so much cheer. You must have had a lovely day with yummy food. Your perfect Sunday made for a great Mosaic Monday! Nothing better than sharing breakfast with family (or friends) on a grey drizzle morning. A really nice mosaic. Those cinnamon buns look delish! I love huevos rancheros eggs! Your jonquils look so pretty ...I am already dreaming of spring.